Whitley LLP Attorneys at Law (Lawyers) is practicing law in Houston, Texas. This lawyer is listed on Lawyer Map under the main category All Law Firms in Lawyers. 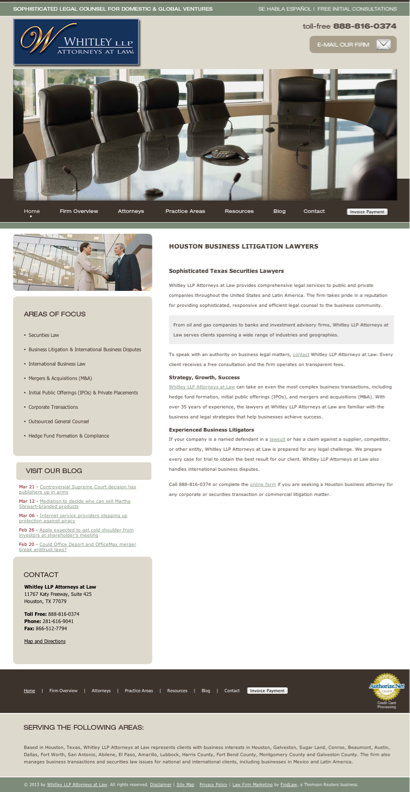 Whitley LLP Attorneys at Law is listed under Lawyers in Houston, Texas . There's currently no information available about fees or if Whitley LLP Attorneys at Law offers free initial consultation. The information below about Whitley LLP Attorneys at Law is optional and only visible if provided by the owner. Call (888) 816-0374 to learn more. Contact Whitley LLP Attorneys at Law to find out about hours of operation / office hours / business hours. Listed business hours are general only. Call (888) 816-0374 to learn about office hours.